The 2 Lazy E Ranch Cabins overlook the Madison River Valley. They are owned by Bill and Sherry Evans who are retired. The cabins are close to several river access points. They are new and fully furnished and are very private with covered porches. The one bedroom cabin is to the left of the main house (picture to the left). Since Bill and Sherry fish, golf, hike and ski, they can help you find guides, horses, or direct you to places you would enjoy experiencing. 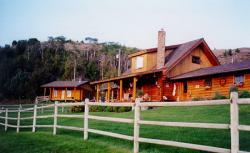 Bill and Sherry would like to share their small foothill ranch cabins with mature visitors. Cabins are only available by the week or longer periods. Seasonal lease available. Many wild animals visit the ranch. Directions: Ranch is 10 miles south of Ennis and 4 miles west of the Madison River. Take Varney Road 6 miles to turn on Shining Mountains Loop Trail to Foothill Trail to Cold Spring Creek Road. We are at the end of the road.